Tired of the traffic jams, high prices and crowds at all the usual restaurants, then, get into your car or hop into taxi and head to an original down-to-earth, clean and excellently priced restaurant in Samashita, Ginowan: "Yuuraku". 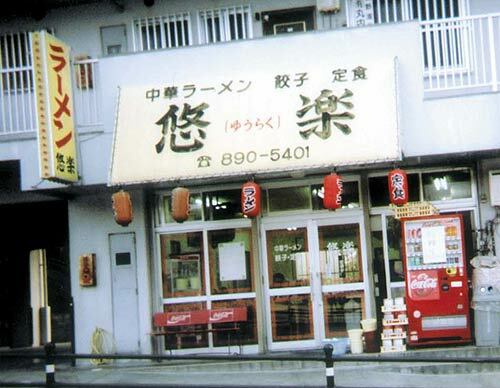 Yuuraku is a family owned business that mixes authentic Chinese and Okinawan style dishes together, with a few secrets that have been handed down from past masters. Yoshihisa Shimoji is a master chef with over 18 years of professional cooking experience. "Yoshi" as his regulars know him, learned his trade in Tokyo, Shinjuku Ward from his mentor Yuya Kekuchi. He started off in the business cutting vegetables and preparing meat. Then, in October 1996 he honorably left his mentor and opened Yuuraku in Ginowan and the place has been booming ever since. Yuuraku is like an American-Style truck stop. The food is hot, tasty and plenty. The most expensive sets are only ¥600. There are over thirty-seven menu items, including vegetarian dishes, pork, beef, noodle and more. Yuuraku is down-to-earth and originally creative. Yuuraku is open 11 a.m. to 10 p.m. Tuesday thru Sunday. However, The Obon and New Year holidays are observed. Take-out is available and the menu has been translated into English. The busiest times are lunch and dinner, so if you want to get your order hot and ready you may call in advance at (098)898-5401. (The staff only speaks a little English). Heading out from MCAS Futenma Gate 2 make a left at the light heading towards Okinawa International University Yuuraku is in the three-story building on the right-hand side with "AU" mobile phone outlet in the same building.